Diwali is the Hindu New Year, also known as the Festival of Light. It usually takes place between October and November and can last for up to four days. Indian families celebrate by decorating their homes with candles and preparing exotic, delicious meals for all to share. This dish is simple to prepare and ready in minutes. 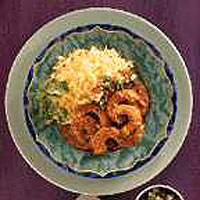 The flavour of the prawns is complemented with a mildly spiced coconut sauce garnished with tomatoes and coriander leaves. Mix together the prawns, ginger, 1tsp garlic and curry paste. Leave to marinate for no more than 10 minutes. Fry the remaining garlic in the oil for 1-2 seconds until light brown. Add the prawn mixture and fry for 2-3 minutes or until the prawns just turn pink. Stir in the creamed coconut, water, tomatoes and coriander. Bring to the boil, simmer for 2 minutes. Season to taste. Serve with Green Label Mango Chutney and Basmati rice seasoned with saffron and a knob of butter. Make a salad of chopped cucumber, spring onions and tomato mixed with coriander leaves, lemon juice, salt and freshly ground black pepper.